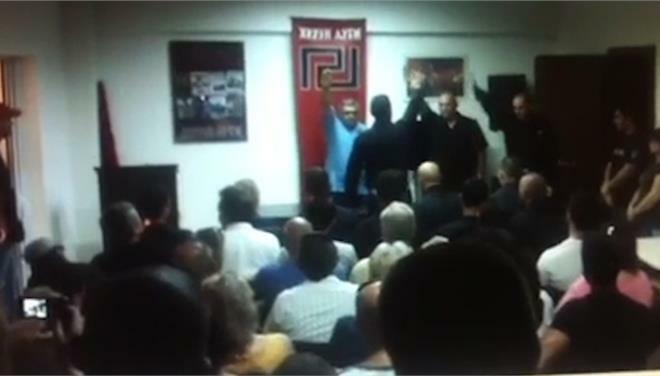 In this post, we provide the translated transcript of the oath-taking ceremony of candidate members of Golden Dawn (“reception cell”), which took place at its offices on 23 July 2011. It is taken from a video, which is included in the Golden Dawn prosecution case file. Following the transcript of the ceremony is an excerpt from the deposition of Giorgos Germenis [Γιώργος Γερμενής] to the magistrates investigating the case against Golden Dawn. His evidence is useful in understanding the structure of the organization, the definition of the meaning of a “member”, etc. […] We see Giorgos Germenis, party leader Nikos Michaloliakos (already accused) and Georgios Misiakas (or Mastoras) appearing on a stand, and the audience. Consecutively, Germenis, his assistant Misiakas and 6 out of 9 successful young candidate members of Golden Dawn’s (“reception cell”), step onto the stand and give speeches. The first to speak is Germenis. Giorgos Germenis: Fellow comrades-in-arms. Today I am in the happy position to present the new nucleus of our candidate members. In a country where patriotism, the true story of our genre, as well as the true course that our genre must follow to finally lead us to a Third Greek Civilisation, appear as unknown words, and to some even outdated, here we have managed to create a krifo scholio (secret school) and teach young Greeks, young Golden Dawners, the ideals of our race, our ideology and our very existence. We have taught our youngsters about the worship of our ancestors, the continuation of land and the blood that flows through our veins, but mainly we have taught the ethos and the virtue of what it is to be a Golden Dawner. Bravery, rectitude, honesty, comradeship – words unknown to the predicament that is called Greece today. We had the courage to present to our youngsters the current Greek situation, as it really is. But let’s not chicken out before the giant with the glass feet, before Jeffrey [George Papandreou], Antonakis [Antonis Samaras], [Angela] Merkel. The courage to present to our youngsters because we have recognized the true enemy of our race, which is no other than the ETERNAL JEW. With regards to the training of the candidate cadet members, during the approximately four months and the 12 thematic modules of training, the candidates displayed discipline and faith and were consistent in all requirements of their duties. The climax was last week’s three-day camp. As a Golden Dawner, I am by nature optimistic and I never stop fighting and I believe that our candidate members will be worthy of manning our movement. Long live victory! I now call my comrade-in-arms and assistant Giorgos Mastoras [Γιώργος Μάστορας]. Giorgos Mastoras: Chief, comrades-in-arms. Before I begin talking about this cell, let me tell you that the training procedures for the next reception cell, for boys as well as for girls, will start in September. I would also like to thank the comrades-in-arms Nikos Giohalas [Νίκος Γιοχάλας] and Thomas Kosmas [Θωμάς Κοσμάς], for their help with these cells and, with regards to those here, I have to say that from the nine candidates in total that successfully completed these lessons, six will be talking to you today. The subject of the talk of these comrades-in-arms has a common subject and character. Its title is “I am a Golden Dawner, because I am a revolutionist”. This means that to us being a Golden Dawner, being a revolutionary, means to draw on life creatively, by joining a superior collective of people who stand out, with ideas and real faith. Being oriented to the great purpose of eternal values, which surpass the bourgeois and Marxist stereotypes. First and foremost, it concerns our internal completion. This has to do with the personality and not the person. It is this internal completion which helps us and motivates us to kill the Jew which we may be carrying inside us, who constitutes the negative side of ourselves, expressing everything decadent, degenerate, miserable and possibly contemptible, which has eroded ourselves in the past. This is the great sacred war, from which we first need to emerge as victors. Then, our mission is to feel the world again according to our own worldview and bio-theory. Because a revolutionary movement like Golden Dawn does not defend the moment but the future. A future (…) in which they will have the truest faith, the greatest patience and the longest memory. So, as simple as it may sound, the word Golden Dawner is complex, fascinating and heroic as a concept, a substance, and of course a new way of life which is based on blood and honor – as one of our old slogans goes, a slogan based on blood and honor. This is why it is no accident that the booming cry “Blood, honor, Golden Dawn” vibrates at our gatherings. In the past, many have passed through the reception cells. Among them, many members and officials of the movement, who through their deeds try to constitute the ideal political paradigm according to the words of Julius Evola: “He is one who acts like a man of the movement”. But there were others, who betrayed and shamed the quality of the Golden Dawner and betrayed our trust. The great Joseph Goebbels said, quite aptly, that “In the hard times to come, the examples will be more important than the people.” Likewise, in the hard times that we are already going through, we believe that the true and savvy Golden Dawners are, in heart and mind, greater and without a doubt more important than those abstract-type nationalists and the other passersby and tourists. To those who make demands on us, but who themselves, from the comfort of their homes, don’t help in the least in this grandiose effort, to those who grumble, talk about themselves, talk meanly and brazenly about the country’s predicament today while playing it safe, refusing to get up from their couch and act positively and essentially, I dedicate to those the following saying: “He who has made himself a worm should not complain if he’s stepped on.” So on judgement day, away from any preaching theories for the remission of sins, apart from our enemies, we shall settle our accounts irrevocably and for good also with all those who pretend to be cunning neutrals. Then, we won’t ask them if they are dangling towards the right or the left, because they will simply be dangling from their hanged necks. Before I give the floor to our new comrades-in-arms and, darting our challenge to the stars, I want to tell you that we are continuing to prepare for the moment of the last phase of the sacred war against this anti-natural and rotten regime. Through our belief in our immortal ideal, through our discipline to the chief and the leadership of the movement, through the true struggle until the final victory, we will draw up the vision, we will seize the day, we will achieve the desired. Come with us. Long live victory! Ioannis Glitsos [Ιωάννης Γλυτσός]: Comrades-in-arms, my name is Ioannis Glitsos. I am a cadet member of Golden Dawn’s reception cell. Were someone in this room to ask me to show him a revolutionary, I would easily point to anyone sitting next to him. Because Golden Dawner means revolutionary. If we examine this more thoroughly, we will see that the reverse also applies. Because, comrades-in-arms, if we exempt the Golden Dawners, who else could support the opposite. Maybe those who are on the left, the anarchists, the system’s beloved children? … Maybe the communists are considered revolutionaries? … Or is it [Georgos] Karatzaferis who will bring the national revolution? How? With his party’s homosexuals and youngsters? … Comrades-in-arms, let’s not fool ourselves. The word revolutionary in today’s Greece is synonymous with the word Golden Dawner. Because the Golden Dawner dares and realizes what the others are afraid to whisper. It is the Golden Dawner who cleaned up Agios Panteleimonas. The Golden Dawner still honors the victory of our heroes. The Golden Dawner is charged with the heavy burden of the awakening, bathing in “APOLLONIAN LIGHT”, the souls of the Greeks. And this is why they are fighting us fiercely. Like the Greeks trying to beat the LION. But they won’t manage to win. And this is because the Golden Dawner doesn’t throw small stones and leaves. On the contrary, he is the warrior that fate has chosen to be the one that shall be forged on the relentless anvil of honor and blood. Our will οf steel is the one which has taken us here and which will lead us to victory. A victory which is not as far away as it seems. Long live victory! Dimitris Theodorakopoulos [Δημητρης Θεοδωρακόπουλος]: Comrades-in-arms, my name is Dimitris Theodorakopoulos and I am a candidate member of Golden Dawn’s reception cell. I am a Golden Dawner because I am a revolutionary and I am a revolutionary because Greek blood flows in my veins. With thousands of years of history, achievements and battles. It is no accident that our DNA is different than all other people’s. It is different because it has characteristics and elements which have been passed on to us by our ancient ancestors, who left an indelible name in the history of the Greek nation with their achievements. Others were warriors, others were philosophers, historians, and so on. This is why we have the duty to these heroes never to give up the fight…. So the baton is in our own hands now, to fight for the two most important things that the international Zionism is targeting and stealthily tries to erase. The blood of our race and the honor of our nation. This is our heritage and we ought to protect it tooth and nail. For many years now they have started to fight the most elementary elements of our civilisation. Our blood, our language and our religion. This is why we see the large wave of illegal immigration in our country. Because they want to erase the Greek element completely. This is why we are also governed by anti-Greek freemasons. I consider it a charisma, God’s gift to be Greek. But being a Golden Dawner is an honor and axiom. It is a way of life. And you don’t become a Golden Dawner by shaving your head and wearing boots (…) Greek conscience, persistence, discipline, many years of struggle for our ideas and beliefs, but above all a heart and soul like that of the ancient Spartans. I am not ashamed nor afraid to say that I am a Golden Dawner. Even if they call me evil, fascist or nazi. If they want, yes, I am also a nazi and nazis will take Greece out of the mire they have thrown it in. I am proud to be Greek, I am proud to belong to a national socialist movement, whose leader and each and every Golden Dawner fights everyday his own battle in the streets and is willing to take a place in the frontline, to fight and be sacrificed for our movement, for our ideas and above all for our nation until victory. Long live victory! Long live Golden Dawn! Long live the chief! Nikos Apostolou [Νίκος Αποστόλου] [accused and on remand]: Comrades-in-arms, my name is Nikos Apostolou and I am a candidate member of Golden Dawn’s new reception cell. I would like to begin with a phrase, which one comrade-in-arms of ours told our cell at the beginning. “Becoming a member does not make one a Golden Dawner.” To tell you the truth, I was puzzled and asked him why. He answered: “Golden Dawners pass exams every day and only they themselves can prove whether they should be and be called Golden Dawners.” I understood many things from that chat, because it helped me believe in myself, to understand that every hour, every moment, I must wage my own struggle, wherever and however it is asked of me. None of us came here by force. We all know the reason we are here … It is our ideas, our beliefs. What we love, the things we fight for … They must understand that our fight is fought on the street, in the way that only we know how. Not in the homes of the armchair revolutionaries. We know they are all against us, they are fighting us with all means. But above all with lies and provocation. Simply, comrades-in-arms, let them know that they will always find us in front of them. In every neighborhood, in every street, in every square. That we shall be united in one fist and we shall fight them with every means until the end. I believe that all of us have a revolutionary hidden inside. A Golden Dawner revolutionary. Because Greek blood flows inside us. Finally, I would like to tell you that from the moment that the chief is on our side and all of our comrades-in-arms which have given everything for Golden Dawn, do not be afraid of anything. Be on our side in every struggle, every battle and the victory won’t be long coming. Long live victory! Long live the chief! Long live Golden Dawn! Ioannis Chrisovitsianos [Ιωάννης Χρυσοβιτσάνος]: Comrades-in-arms, my name is Ioannis Chrisovitsianos and I am candidate member of Golden Dawn’s reception cells. Golden Dawner. Great words, but we are so small. I wish some will manage to touch it. A particular way of life, advocating Greece. Wherever you place him, he will stand out. You will always see him at the front, holding the banners. His tears will transform into anger. And he will always be at the front, rousing in his wake. The slumbering, the comfortable, the betrayed. They point the finger at him. And he answers back. You should be scared of me instead of sorry for me. He never leaves anyone behind in his path. He knows that his comrade-in-arms is his own brother. They would share even the last breadcrumb. In them the blood of the immortals is seething. The blood of their race, which guides them. They want to touch a little bit of that and they run. Forward, always forward. They are the continuity of values and ideals. And he knows that. And they point the finger at him. And he shouts with all the strength of his heart. Yes then, I am a revolutionary, I am a Golden Dawner. I am worth something. I am the continuity and the idea (…) that you without vision created (…) So all of us here, a smile inside us and united in one fist under our banners and faith to our idea, we rush forward, always forward, and that takes us to the light of hellenism. Comrades-in-arms, friends of the idea and the vision! Let’s not hide behind our finger. The nation of light is in the darkness. They know us and we know them very well. This is why they’re fighting us. And we become more stubborn and we laugh. Because nothing can beat us. They say a lot and do nothing. While we, a little and good. They are all traitors and deserve the heavy axe. While we are pure in our faith, not believing in money, they worship it as their god. They sold everything out, without asking anyone. Is it democracy that they’re talking about? We are Greeks under occupation, but, hey, there is still a flame. I heard they call them the last believers. They have a faith that’s stronger than fire. A fire that will burn them alive. Let’s all get out of these walls, with the people’s voice as the only heavy weapon. Lets tell them about the krifó scholió of hellenism. They should all send their kids across this threshold with pride and all together shout the history that is fermenting. Like the bones of our heroes are fermenting. Who look down on us from up high, but they are by our side and guide us so that the golden dawn of Hellenism comes. Long live victory! Long live the chief! Long live Golden Dawn! Konstantinos Alexandrakis [Κωνσταντίνος Αλεξανδράκης]: Comrades-in-arms, my name is Konstantinos Alexandrakis and I am candidate member of Golden Dawn’s reception cells. It is certain that Greek society, Greece, is in an unprecedented swamp. In reality, it has been in this for a long time now. That’s where the so-called system led it, which unfortunately is so multilayered and multifaceted that it really covers all of society. Starting from the politician and the journalist and ending in all those who accept the parties’ state, which is clearly our misery. In reality this rottenness, of which we are just witnessing the latest stage, the gangrene, covers an overwhelming percentage of our society. I wonder who among us doesn’t know someone who has bowed to the contemporary Mammon … There is no time for Phanariotes, not for a supposed fall of the system from within. The enemy is no longer at the gates, it passed them a long time ago. In reality, we are experiencing a situation similar to the one Theodoros Kolokotronis experienced. And who can say the opposite, when the antiracist nongovernmental organizations are a state within a state, when illegal immigrants get outrageous allowances to murder the now-bankrupt Greeks. When many organizations are funded by the Greek state to undermine our national sovereignty and our national status. What is the difference with the janissaries [Ottoman troops mostly raised using non-Muslim children]. What’s the difference with paying the [Ottoman] head tax [on non-Muslims]? The only solution, consequently, for the situation that we are experiencing is revolution, in its etymological sense first and foremost. Meaning a change of position, which shall sweep through all aspects of Greek society. A change of position, like the great Pericles Yannopoulos indicated. Meaning an ethical, individual, social, political, ideological, philological revolution, a revolution which will connect all the powers of the race and will devastate with light all the darkness in which we live. The reason for my talk today is my official integration into the Golden Dawn family, the society of equals. In a society that stands proudly, diametrically opposite Greek society in the way it has become. The purpose of the talk is to prove “if and only if” between the concepts of revolutionary and Golden Dawner. Because this “if and only if” not only exists, but we should also understand it deeply. Put it in our souls. In times of anti-nationalism, nobody but the nationalist can be considered as a revolutionary. In times of individualism, no one else can be considered a revolutionary except the socialist. In times of endless collapse and national underbidding, the only answer is popular nationalism. In a world that is anarchic and destructively neoliberal, no one else can be considered a revolutionary except the disciplined, political soldier of our ideology. Who, with faith in faithless times, sacrifices his ego on the altar of the common cause. Only the Golden Dawner is the warrior and philosopher at the same time. And with these words, comrades-in-arms, I thank you for accepting me into this society. It is time we all work together, with faith in the chief, in the leadership of the movement and of course in the idea of the country and the people. Long live victory! Alexandros Lyris [Αλέξανδρος Λύρης]: Comrades-in-arms, my name is Alexandros Lyris and I am a candidate member of Golden Dawn’s new reception cell. Almost all Greeks, whatever their interest in politics, have heard about Golden Dawn. A name which causes fear in many, sometimes justified, sometimes not. Personally, I decided to pass the threshold of Sokratous St [location of a Golden Dawn office], I didn’t know what to expect. At the end I was convinced by my comrades-in-arms of the purity of their intentions and I joined them under the banner of Golden Dawn. But where does this banner lead? Which is the final purpose? As it is known, the Popular Assocation–Golden Dawn is a legal political party which participates normally in elections. But does this say the entire truth? Of course not. Our similarities with the rest of the parties, or, to say it better, our similarities with the rest of the political world, stop there. We do not ask for votes, we fight every day; and if the votes come they are the recognition of the fight we would be waging anyway … But our most basic difference is that we don’t want to improve or change this state or this declining society. We do not aim at preserving and reinforcing a dilapidated building … We are going to tear this building down to its foundations. Then, we will turn to the healthier elements of our nation, to build the new state on its ruins. A nation state, a socialist state, a revolutionary state. This state shall shape the society of tomorrow. A dynamic society, meritocratic, revolutionary, far from today’s cesspit. A society of blood and honor. There are three things that one needs to be a Golden Dawner. To love his country, love his people and above all to be a revolutionary. The only true and popular revolution that can save this nation. So never forget that being a revolutionary means being a Golden Dawner. Being a Golden Dawner means first and foremost being a revolutionary. Long live the chief! Long live Golden Dawn! Long live victory! After the they finish their speeches, each cadet shakes the hands of Mastoras, Germenis and Michaloliakos, and at the end gives the nazi salute, himself as well as the other four. At the end of the ceremony, they stand to attention (after the relevant command), they chant the anthem of Golden Dawn and they all give the nazi salute. MAGISTRATE: How do you justify that in the above procedure, the talks of the speakers (i.e. yours, Mr Misiakas’ and the cadet members’) reflect clearly the nationalist-socialist ideology as well as the principles that in general have been stated in the first article of [the party’s] constitution, which Golden Dawn considers as falsified, as fake, as nonexisting? GERMENIS: It is a gathering, which is open to the public, for the reception of candidate members. Regarding the procedure for someone to become a cadet member, this is what happens: The candidate attends seminars frequently, lessons, in which he takes part, and he seems to be interested in this and he is willing to learn what Golden Dawn is, and if that represents him at the end, if what we say suits him, to become a cadet member or not. The lessons are Greek history, European history, Greek poets, political issues related to Greece, and the ethos of the Golden Dawner as we call it, who advocates in society. These are the thematic units. The lessons are given by myself and some other comrades-in-arms. One is not only judged on the basis of these lessons, simply by whether he agrees with what we say or not. Maybe 15 persons registered and 8 or 9 remained, meaning they agreed and had time to offer. Some may agree but don’t have the time to hell or contribute to the party. Most are breadwinners. This is what we mean when we say successful. MAGISTRATE: What is the three-day camp at the end of the procedure which you mention in your speech? GERMENIS: If I remember correctly, it is summer. Other people go too, not just the candidate members, and we discuss what I’ve mentioned before, we engage in sport, hold conversations of ideological content. MAGISTRATE: Since the procedure for someone to become a cadet member is simple, like you mentioned, why did Mr Misiakas, in a relevant article he wrote in Golden Dawn’s newspaper, mention: “accession to the movement is time consuming, as well as tedious … War today is fought on different levels, so really our warriors have to be trained in all subjects that contemporary circumstances demand,” referring to the reception cells of candidate members and juxtaposing them with the way one joins a bourgeois party? GERMENIS: When he says tedious, that [means that it demands] many weeks and many hours, which cost someone by being away from their work, their family, their home, their friends, to have discipline. For the rest I cannot express an opinion. It’s out of poetic license. MAGISTRATE: The text that each of the successful candidates reads out loud, is it checked by someone? GERMENIS: No, not to my knowledge. MAGISTRATE: Theoretically can someone come up and say something against [the party]? GERMENIS: It is possible that there are some candidate members whose views don’t match ours. MAGISTRATE: Who can participate as a candidate cadet member for Golden Dawn? GERMENIS: Anyone who has had a frequently presence in the Golden Dawn party. MAGISTRATE: What kind of presence? GERMENIS: To come, attend our gatherings, our talks and who shows interest. MAGISTRATE: So for how long can they come and watch? GERMENIS: Could be seven months, could be a year. MAGISTRATE: And what does the candidate member do afterwards? GERMENIS: Then he has some duties. He takes over the operation of the offices. MAGISTRATE: Does he have any privileges? GERMENIS: No. I wish we had some to give them. MAGISTRATE: How does the cadet member evolve afterwards? GERMENIS: To become a member. MAGISTRATE: After how much time does he become a member? GERMENIS: There is no specific timeframe. Normally, he must be proposed by two people who are already members. MAGISTRATE: Besides being proposed, is there something he needs to do in particular? GERMENIS: If there is relevant presence, he is proposed by people from the Central Committee. MAGISTRATE: How much time does it take for a cadet member to become a member? GERMENIS: This hasn’t happened in many years. It has waned. MAGISTRATE: How many members does Golden Dawn have? GERMENIS: About 2,000 members, if I remember correctly. MAGISTRATE: After becoming a member, what happens to someone? MAGISTRATE: Regarding the above-mentioned, how do you justify the fact that the speech of Golden Dawn member Mr Misiakas contains exhortations to extreme violence, like mentioned in one of the questions above, while addressing the candidate members but also the people who were present in the offices, and one of the candidate members says indicatively: “I am not ashamed nor afraid to say that I am a Golden Dawner. Even if they call me evil, fascist or nazi. If they want, yes, I am also a nazi and nazis will take Greece out of the mire they have thrown it in. I am proud to be Greek, I am proud to belong to a national socialist movement,” and [talks] about warriors etc. What was Mr Michaloliakos’ reaction, and yours, to all this outburst of hatred, towards youngsters, but also to the people, so that misinterpretations of Golden Dawn’s principles, as you have described them in your answers, would be avoided? And given that for many years, since very long ago, violent facts and incidents have taken place that have been attributed to Golden Dawn, also until recently, like the circumstance of the murder of Pavlos Fyssas [in September 2013]. Based on all that, what was the stance of the political party Golden Dawn? GERMENIS: I think that we have thousands of statements where we condemn all these facts and forms of violence, no matter the source, also inside parliament and after the murder of Pavlos Fyssas, and in our offices, we were saying that out loud that nothing [like that] should happen because it would be turned against us. At this specific gathering, in the video of the oath-takings, my speech doesn’t have this kind of content. I cannot endorse what Mr Misiakas says after me. But of course it is a political speech. No one was hanged with rope. We ourselves condemned violence because, ultimately, what happened was against us. Now, not even the President of the Republic came out to condemn the murder of the two kids [Manolis Kapelonis and Giorgos Fountoulis outside a Golden Dawn office in November 2013]. Nor the Prime Minister. I am 100% innocent, I did not urge anyone to commit violent actions, I have been working since I was discharged from the army, I’ve never been unemployed and when I entered parliament, even though I’m a baker, I’ve had the highest attendance of all Golden Dawn members and all MPs of other parties. With regards to the salute, I do not accept its a nazi salute. It is Greek. I consider it a very ancient Greek salute which was also used by the Metaxas regime, which fought the German invader. We do not have Nazi symbols. I declare myself to be a Greek nationalist. My presence shows that I continue my parliamentary work, even though these past three months I needed sedatives to sleep. Although I’m a baker, I have tried as I best I could and I do not think that there is any reason for taking me into custody etc. The same is also shown by my previous way of life. I would like to stress that I have never been a racist.